With over 30 million Americans playing Golf, it is now the fastest growing recreational sport. Players and Lovers of the sport increase every year and maintain a loyalty for the game throughout their lives. Americans spend over $50 Billion on Golf products annually. Along with this growing interest in Golf, residential Golf Greens have become as desirable a recreational landscape feature as a swimming pool, tennis court or spa/hot tub. Would you like to tap into that $50 Billion? 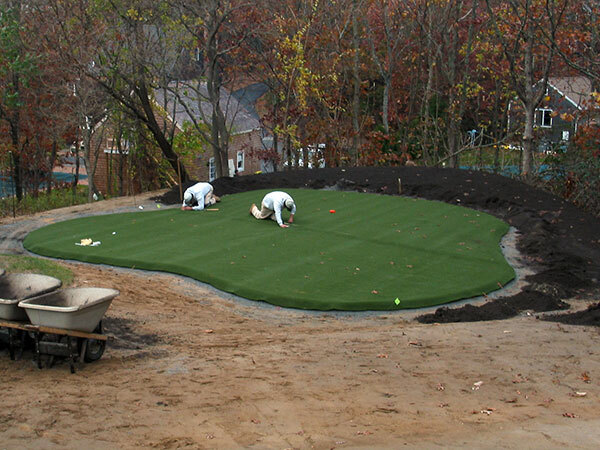 Personal Putting Greens, Ltd., located on Long Island, NY is the Premier Designer and Builder of Synthetic Turf Putting Greens. Since 1990, we have brought unique golf course design to the homes of hundreds of Golf Lovers. Our superior golf green designs, quality construction, proprietary putting turf and five-year guarantee set us apart from the rest. Over the past 20 years, we have continually developed, tested and refined our sales, marketing and construction procedures. We have taken our experience and knowledge and created a Dealership Program that offers installation, business and growth support. An Operations Manual: A complete How-To Guide for starting and growing your business. Quick-Start Guide: A concise guide to help the Dealer set-up to get started selling immediately. Installation Training: Hands on training available on-site with our crew. Proprietary Turf Products: Exclusivity within an assigned region for resale of all our turf products. Exclusive Territories: Available to the Dealer to limit competition within their area. Portfolio of Completed Greens: An extensive digital portfolio of completed projects to assist the Dealer with sales, marketing or presentation purposes. Marketing Resources: Brochures, Postcards, Advertisements, etc are made available to the Dealer to assist in growing their business. Job Referrals: All leads within a Dealers territory received via phone, website, etc are forwarded on to them. You do not need a lot of employees to be successful! Most installations can be completed with as few as 2 people on the job (many times this includes the business owner). Additional crew members, office support, and sales staff can be added as the Dealership begins to grow. We understand that not all business needs and resources are the same. In response, we have developed multi-stage Dealership Opportunities. This allows you to secure a Dealership with a smaller investment and upgrading as your Dealership grows. Contact us directly to learn more about this exciting opportunity.